Each softgel contains no fewer than 75 different active molecules - a long way from the type of synthetic pharmaceuticals which contain just four or five at the most. What are the essential oils in Relaxing Oil Blend? Essential oil of sweet marjoram, the main constituents of which are cis-thujanol and trans-thujanol. It is a powerful regulator of the central nervous system with anxiolytic (anxiety-relieving) properties, but is also used for its antiviral properties, its ability to regenerate the liver (viral hepatitis) and its effect on bronchial symptoms. Essential oil of lavender, of which the flowering tops – rich in linalool, linalyl acetate and camphor – are used. It has shown remarkable efficacy in easing mental tension, calming nerve and heart palpitations, treating depression, and curing insomnia and other sleep problems. It’s also a recognised anti-spasmodic and sedative. Essential oil of mandarin of biological origin, of which the zest, particularly rich in limonene and gamma-terpinene, is used. Popular for its fragrance, it is primarily used for treating stress, agitation and anxiety and also has blood pressure-lowering properties which can stop palpitations and extra systoles (extra heartbeats). Essential oil of lemongrass, obtained from the essence of flowers rich in nerol, geraniol and monoterpenes. It is used especially for its calming and sedative properties but it also combats indigestion, gas and pain associated with gastric ulcers. Essential oil of lemon verbena, produced from the leaves which are rich in nerol and geraniol. Excellent for addressing temporary depression, it has powerful sedative and anti-inflammatory properties. It also helps regulate the hormone system and is a vesicular and pancreatic stimulant. Though aromatherapy is increasing in popularity, it’s important to recognise that essential oils are not entirely risk-free. Used indiscriminately, these oils can actually be toxic, especially when taken internally, and even more so as some companies recommend unsuitable doses or are not clear enough about either the botanical source (there are many homologues) or the chemotype. This last point is important: the chemotype provides precise information on an oil’s active and predominant biochemical molecules. A plant will produce specific aromatic molecules depending on the biotope in which it is grown: two identical species can produce two different essential oils, each of which is characteristic of the conditions in which it has been grown. A lack of knowledge of an oil’s chemotype thus opens up the possibility of toxicity and reduced efficacy. The chemotypes of the essential oils in ‘Relaxing Oil Blend’ are always specified and the active principles are dosed to maximise their efficacy and ensure their safety (no more than 75mg per softgel). Why take Relaxing Oil Blend to reduce stress and relieve tension? Anxiolytic, hypnotic and antidepressant drugs are widely-used for treating stress and insomnia, but they often cause dependency and unwelcome side-effects. It’s high time natural alternatives were given due consideration, particularly the unanimously-recognised option of aromatherapy. 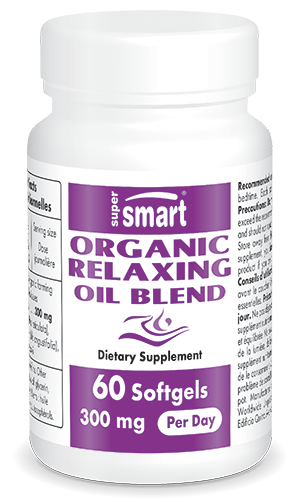 Relaxing Oil Blend concentrates those oils most widely-accepted as synergistically combatting stress and the symptoms of anxiety. A number of essential oils act on the central and vegetative nervous systems, but taking them orally can be quite problematic. To avoid any unnecessary risk, it is therefore advisable to consult a therapist from the outset. Opting for Relaxing Oil Blend, which has been the focus of considerable expertise, means avoiding any risks to your health as its combination of oils has been chosen by leading health professionals for their complete safety and optimal efficacy. The ready-to-take softgels save precious time and facilitate therapeutic observance: avoiding the need to mix the blend yourself prevents the risk of potential errors and unwelcome consequences. Other ingredients : rapeseed oil, glycerine, water, tocopherols.